This is a perfect gear to control every aspect of Ableton Live. Nice product. However, absence of faders and knobs is really a big downside. Hope that the velocity sensitivity can make up for their absence. Might return this product though. My first grid controller. So far mainly using it as a keyboard. Found that having a different interface compared to a normal keyboard makes me play melody shapes that I haven't played before. Love having polyphonic aftertouch. !!! easy fun and functional !!! Estoy satisfecho con mi compra, ojalá hubieran más instrucciones en español. Really good midi controller, made awesome by its firmware being open source. I bought a refurbished one. The box was a little damage but the rest was fine. Very good build and quality. I would just wish the pad to be slightly bigger, but since I bring the launchpad with me while travelling, small is also an advantage. Süper tuşlara sahip tepki süresi oldukça yüksek bir cihaz. This is a really neat instrument/controller. I thought I was just going to use it as an Ableton/MIDI controller, but it turns out to be a really great instrument too, due to the "Scale Mode", which allows you to set the pads to play certain scales (with tons of scale options). So it removes all the notes which don't sound good in sequence together, making it really easy to play. Excellent way of starting in achieving my dreams! So far so good, a lot to learn and could have been good if a paper full user manual could be included, but for the environment's sake i'm happy with using a web version. Very happy customer! Perfect packaging, incredible delivery time & a great product! The best experience in my life ! A big thank you ! I love this thing like honestly it's awesome! Building quality is good. I like the set of features that the current firmware is offering. The pads has a nice feel to them. An excellent choice for live sessions. Novation has done it again. Easy to use. Effective through production and performance. The DJ/Producers Swiss Army knife. Great Equipment. Needs some good practice if you do not have enough experience. Awesome Product once you learn how to use it. Check the tutorials online and it will be fine. A really good choice in my opinion. I started using ableton's launchpad a year ago. When switching from launchpad mini to pro, the experience boosted up ! With a little perseverence, very good result's can be achieved. I recommend this product very much but you maybe should start with a smaller launchpad before heading towards this one. I choose this because it was smaller and lighter than a Push for carrying to gigs. It gives me the similar integration (except for sampling) as Push, in a better format. The software integration with Live is great - it just works. And there is enough room (the User mode) to add additional mappings. Lastly, I really like the velocity sensitive pads, not only for percussion, but also for playing synths. Grid based pitch is pretty nice way to play. My only gripe would be that the Note mode doesn't do scales, only chromatic mapping. I really love the amount of colors and ease of use it has. Very satisfied, works incredibly well with Ableton and you get right into creating music quickly, love the pressure sensitive pads and colours. Thank you Novation. Everything you need and then some. The LED color is rich and bright. Touch pad incredible. Easy to navigate. Clearly Ableton based Push 2 around the Launchpad design because the first version of Push crafted by Akai didn't come close. Have owed all 3 versions and it keeps getting better. Nothing in its price range compares. It's All you need, laptop, mic and Launchpad Pro! I love the launchpad pro! It is a big step up from the launchpad S and mk2. I use it most for covers and light shows (currently a quad launchpad cove including 2 mk2s, a pro, and S). LaunchPad Pro is integral to my workflow. Controls Ableton flawlessly, though my favorite use is as an instrument - the big grid gives a wide range of polyphonic notes to play. And with its open architecture its extendible into further creative uses. Physically sturdy too - and if coupled with a LaunchControl XL gives you unprecedented control over your production software. Useful and inspiring! Functions exactly as expected and provides a great medium to interact with ableton live! After debating on whether to just buy the Launchpad Pro or an MK2 to save a little money, I decided to just fork over the extra money and for the past 7 months I've been so happy about it, my favorite feature is the standalone mode and that I've been able to use it in tandem with my friends MiniNova synth and the velocity pads feel nice to use, if you have projects that use several controller type instruments I'd recommend buying this it was worth it for me so hopefully it will be for you to if you decide to pick one up. Love everything about it, just wish it had key lock like the Push! It's the only thing missing. I have spent the last two weeks using this device on its own along side Ableton Live 9, and have loved every minute. After figuring out ASIO4ALL, the minimal delay made the Launchpad Pro shine. 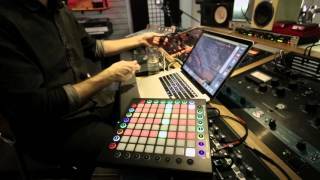 My only complaint is that my Launchpad will not work with Live 9.6.1, but only 9.6 or 9.5. Amazing very verstile especially in the MIDI area piece of music hardware/instrument loving it . would get 5 stars only one problem. when you going off finger drumming or jamming on instrument if you accidently hit the bottom row of functions buttons can stop your whole live performance dead. should have a way to dectaivte those buttons since they had to put them there are a way were they stop being function buttons and become instrument pads. Did not work for me. Returned the item and purchased the Ableton Push 2. Lauchpad Pro is a great product. I needed the knobs and additional functions of Push 2. If you already have Ableton Live it must be version 9 or greater to work with Launchpad Pro. We recommend that you update to the latest version as previous versions of Ableton Live do not include the Launchpad Pro integration. Launchpad Pro will also work as a standard MIDI controller. Get the Addictive Keys virtual instrument from XLN Audio free with Novation products. One full license per account enables you to choose one Addictive Keys instrument, such as Modern Upright, Studio Grand, Electric Grand or Mark One. The 8x8 grid of RGB pads light up to match the colour of your clips in Ableton, so you can concentrate on triggering and combining your loops and ideas. The pads automatically assign themselves to the notes of one of 32 keys and modes, making it impossible to play out of key.Make dynamic beats: drum racks are automatically laid out and illuminated, which makes it as easy as possible to create expressive beats and drum performances using the velocity and pressure-sensitive pads. Lightweight 'shell' for your Launchpad Pro with removable li that becomes a desk tray.